The tiny Pacific island of Nauru has spent weeks completely cut off from the outside world after its telecommunications network collapsed. Its isolation is so complete that no one is even sure who the country's president is any more. Nauru, an isolated speck in the southwest Pacific with a population of 12,000, is in a "critical situation", according to the last message received by the outside world. That came via an address given three weeks ago by the man last believed to be running the country, President Bernard Dowiyogo, details of which were given on Friday by Radio Australia. The president said that many people had not been paid since last year and that the eight square mile (21 square kilometre) island was effectively broke. "You are all aware and conscious of our critical situation," Dowiyogo said in the address. Nauru's telephone system collapsed on 8 January amid political chaos, and since then the island has only been contactable when ships equipped with satellite telephones made stops there, the AFP news agency reported. Nauru's diplomats in New Zealand confirmed to the agency that apart from these few calls, they had been unable to contact home for weeks. The situation is compounded by the fact that when contact was last made, a battle was raging for power between President Dowiyogo and the man he unseated in January, Rene Harris. No one is quite sure who runs the island now. Additionally, whoever is in charge is thought to have no budget with which to rule, while the official presidential residence was reported to have burned down last month. It is a sad demise for an island which not long ago boasted one of the world's highest per capita incomes through lucrative phosphate mining. But with the phosphate reserves nearly gone - and most of the island reduced to a barren moonscape as a result - Nauru has gradually slumped into chaos. In an attempt to find a new source of income, Nauru has recently become a major centre for offshore banking and is accused of allowing rampant money laundering. The problem is so bad that more than 400 banks were registered to one mailbox alone, international investigators say. 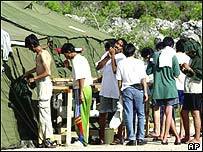 The island has also begun interning asylum seekers while their applications to live in Australia are processed, in return for aid from Canberra. However this appears to have gone badly wrong. Late last year, Australian immigration officials admitted that the asylum seekers, mainly Iraqis, had been running their own detention centre since officials abandoned the site following a riot. "Effectively you could call it a self-managed centre," a senior Australian immigration official told an inquiry.